Description of "Neesah Issue 2"
Neesah is a quarterly magazine that will gradually have an annual print issue. Neesah explores the different sections associated with the Book. Along with prose, poetry we have feature articles focussing on books. For this issue we have focused on poetry and prose from the hilly mountains and the vast picturesque landscape of the north-eastern region. 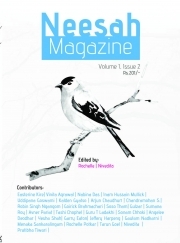 We also have features and articles on Shillong Book Fair; Hyderabad Book Fair; Read and Pass On Initiative and the Prakriti Poetry Festival. Reviews of "Neesah Issue 2"